Harvest for this townie is often gleaning off the land. I know where wild blackberries are to be found and where old apple, plum, cherry, and pear trees grow in rural abandoned areas. I’ve memorized back alleys where ancient unharvested trees drop forgotten varieties and where the nicest raspberry bushes are. Each year I fill my freezer with gleaned fruit for winter. But I never get around to using it all and by spring I’m scrambling to do something with it before the season begins again. However, by then I tend to forget important details. Like if the fruit was ripe. So I made a plum crisp. A painfully tart and tannic plum crisp. Long story short. The crisp was so sour we gave up and I made another one. This time with my favorite canned Oregon Fruit. And oh man, it was so good. Perfectly sweet with lots of plum flavor and a crispy vanilla crust. Half the benefit of canned Oregon Fruit is the heavy syrup it comes with. The syrup adds so much body to whatever I’m baking that I always adjust recipes to include some of it, as I’ve done with this crisp. For when the actual ripe plums arrive, I’ve included a recipe adjustment for fresh fruit. This crisp also works well with peaches or pears. Ripe ones at least. If you don’t have vanilla sugar on hand, stir a teaspoon of vanilla extract into the filling. 1. Preheat oven to 350 degrees. Set aside a 1 1/2 quart baking dish or a 9 1/2” pie dish. 2. Strain the juice from 1 can of plums into a large bowl. Strain the other cans of plums and discard the juice. 3. Place the plums on a cutting board and gently slice out the pits. Cut plums into 3 to 4 pieces each. Place them in the large bowl. 4. In a small bowl, mix together the vanilla sugar and flour. Sprinkle over the plums. Drizzle with almond extract and gently toss to combine. Pour the plums into a baking dish. 5. Move on to topping. 1. Place the flour, oats, vanilla sugar and salt together in a medium sized bowl. Toss to combine. Drizzle with butter and stir just until crumbly. Use fingers if needed. 2. Sprinkle topping over crisp. Bake for 40 to 45 minutes until bubbly and top is golden. If needed, broil the top for a few minutes to crisp the topping. 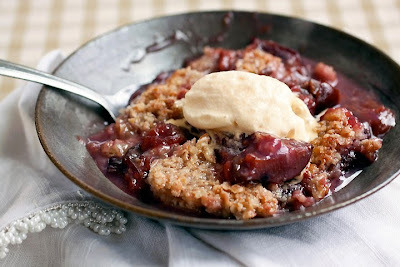 Fresh Plum Variation: Use 5 cups of pitted and quartered fresh plums and reduce the flour in the fruit to 1 tablespoon. Peach or Pear Variation: Canned peaches or pears work well with this recipe. If using fresh fruit, measure out 5 cups of sliced fruit and reduce the flour in the fruit to 1 tablespoon. I am smiling-I think the crisp with the Oregon fruit, is the one I pick too but, there is something to be said about picking the fruit right from the tree. Happy almost Summer to you. Hahahaha!!! This reminds me of the kohlrabi ham gratin I made a while back. I took a few bites and looked at my hubby and he said um, this isn't that good. I was chewing and then said yeah. It is pretty disgusting. And we threw the whole thing out. I was so bummed. At least you had a good save wtih the Oregon fruit! Ah totally seems like something I would do. We have some containers of pesto in our freezer that have been there so long I'm not even sure what year they're from! Not good. The crisp looks fantastic though and I'm so glad you gave it a second go for all of our benefit! I know *exactly* what you mean about freezing things and not using them like you thought you would. I've been making a lot of pumpkin bread because I thought it was necessary to make and freeze puree from the two dozen (yes, two dozen) pumpkins I grew in my garden last year! :) It's a good thing I love pumpkin. Hello! I just found your site and fell in love with your pictures, so I'll be following you now. That dessert sounds just heavenly! Delicious! Back in Finland I used to freeze berries and other seasonal produce, but now I don't seem to do it as much. Thank you so much for using Oregon Canned Fruit and being our most famous fan! As I said on FB I wish I lived close to you so I could eat this without actually having to make my own, but alas, I guess I will have to bake! Mmm you are making me drool laura! Lovely presentation, too. This look so yummy!! The peach would be good too! Yummy. Looks light and refreshing. Cant wait for our fruits to start coming in! I didn't even think people really ate kohlrabi. I mean, come on.